Specialists from all across the health and wellness field have always been welcomed to come on “The Doctors” TV show to offer their insight about health care tips, trends, and some of the most popular surgical procedures performed on well-known celebrities. 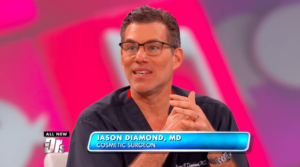 Dr. Jason Diamond is no stranger to the celebrity world. He was invited to join the show’s panel and discuss trending topics within the plastic surgery world. Earlobes are one of the most popular parts of the body that celebrities are having augmented. Dr. Diamond talked about his recent earlobe surgery on Kris Jenner and explained how our earlobes begin to lose volume and elasticity as we age. He also explained how heavy earrings are a contributing factor in ear descension. Dr. Diamond assured the audience that this problem is easily treatable through various procedures or fillers. Dr. Diamond and the other panelists discussed the current trend in breast augmentation, which has been more focused on downsizing breast size and creating high-quality breast lifts. This trend is largely different from the early days of breast augmentation when everyone was looking to have as large breasts as possible. Text neck, or neck wrinkles caused by the compression of the skin when someone is looking down at their phone or computer screen, can cause bulging muscles and creases. Dr. Diamond informed the audience that this condition can be prevented by sitting up straight and bringing the phone eye level, rather than hunching down to text or scroll through your phone. Minor wrinkles and lines can often be treated with a facelift procedure. However, deeper or lower lines and wrinkles may need to be addressed using injectable fillers to improve the neck.